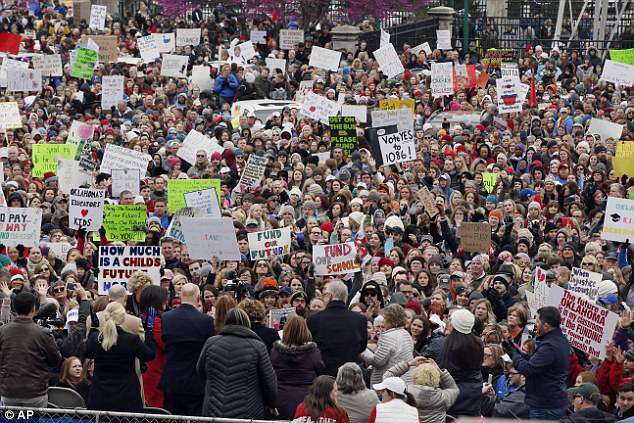 The outbreak of teacher’s strikes in several red states where unions are suppressed highlights how much not only teachers, but the survival of public education itself–even our democracy, is on the line. It was no less than Thomas Jefferson who said that democracy was impossible without an educated citizenry. And that’s just it. Without the broad mass of our people being properly educated, the understanding of our democratic experiment, enabling the people to support democracy is lost. The wealthy, corporations, yes, ALEC (American Legislative Exchange Council), the Mercers, the Adelson’s and Koch brothers, leaders of today’s irrational GOP all know that an ignorant populace is easier to dupe and control. Oddly enough, this direction taken by the leadership of the American right is lost on those most in need of furthering themselves, without regard to the color of their skin or the circumstances which we arrive in at birth. When two thirds of conservatives say they believe college or a university is actually bad for you, where they celebrate their own ignorance along with President Trump and his cronies, and especially at a time when financial support for public education is at a historic low dating back to World War II, you know our nation is in trouble. Worst of all, when public education is diminished, one of the primary means for people to advance themselves so they may grasp opportunities to improve their lives and that of their families is closed off. The wealthy and well connected have no such compunction against education, sending their kids to top rated and exclusive private schools or academies where they get the fine education once provided to us all. There is no shortage of elite education among these people. Why then, don’t the uneducated demand better public schools and more support for education? Simply because contemporary conditions, and the intentions of that elite are to push more and more Americans into second class citizens, controlled and manipulated by that small elite over the rest of us who no longer need to be educated. In point of fact, the leaders of the nation on the right, and their wealthy patrons no longer want to contend with the messy trappings of democracy, the bleating’s of the masses, who want to play their part in determining our common future. A compliant and docile labor force of menial workers is where we have been going. And GOP leaders in particular have been directly complicit. There are some moderate Democrats, who by their remaining quietly complacent about these things, and sharing some common donors with their GOP brethren, have indirectly been complicit. What’s needed is renewed support for public education funding, strengthening teacher Unions as supporters of public education and their students. It is not all about teacher salaries, though college educated and talented people should earn a living wage. In Oklahoma teachers there each got a six thousand dollar a year raise. 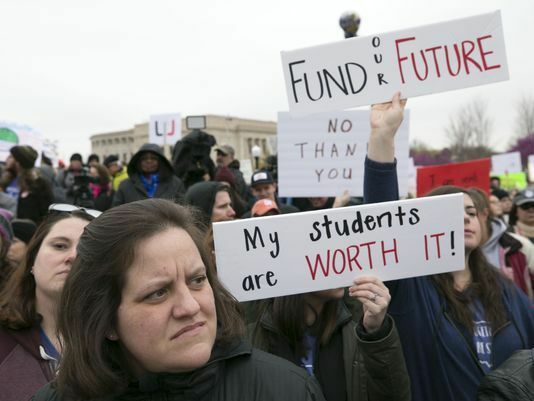 But they remain on strike until financial support for education by the State legislature can redress the Sam Brownback Era of reckless and merciless cuts to education that have left the schools in bad repair, working on four instead of five day school weeks, short of books and more. It isn’t just inner city black kids that are getting shafted. White kids of the struggling middle class are everywhere getting the same treatment. Race is still a big determinant of the quality of education, and where funding goes and does not. But now, white children are no longer shielded as they once were. The Betsy De Voss’s of America by trying to squeeze out public education funding in favor of religious private education are in direct fashion attacking our democracy as well. For public education itself is a pillar of our American democracy. School districts across the nation are run locally by democratically elected school board members. School districts themselves are democratic institutions. Private schools are not. After World War II, the Greatest Generation oversaw a huge expansion in educational opportunity. There was the GI bill where millions of GI’s returned from the war zones got to go to college or university or even some sort of training or technical school. It powered much of the prosperity of the Baby Boom era. The emerging Cold War with the Soviet Union, now Russia, demanded an educated populace better prepared to stem the communist tide of expansion that really did threaten the free world and its democracies. A Defense Education Act provided more funding for university graduate programs in the sciences, and more aid to college students more broadly. I got several Defense Education Loans as grants. What by contrast do we have today? College students are burdened with debt. The cost of going to college has risen to almost absurd levels with university boards of trustees and college Presidents, and big donors more concerned with better sports programs and building projects as monuments to those donors. Supporting the teaching staff at the university with good pay and a proper number of tenure track positions, instead of the armies of adjunct professors making what are literally starvation wages tells us the infection goes right to the top. Education Secretary Betsy De Voss owns a company that makes loans to students at much higher rates of interest than a government program that would put education and America first. She is uninterested in the public school or a broad and high quality education generally. She is out for the money, and to promote religious education–and by that we mean Christianity only. We ought not strangle these institutions of democracy in a bathtub with misdirected and such poor understanding of how public education underpins our very democracy and the opportunity central to the American Dream. This entry was posted in Community and Citizen Action, Education, Essays, It's About Struggles for Justice, National Affairs, The State of Labor and tagged Betsy De Voss, education and democracy, education and our democracy, Oklahoma terachers strike, President Trump, public education, school boards, Students, support for public education. Bookmark the permalink.